As the leading edge of the baby-boom generation begins shoving at the half-century barrier, many boomers find they aren't remembering things from their childhood quite as well as they used to. Billy James Hargis II, however, will always be able to find a favorite childhood memory. All he has to do is enter a room of his Houston, Texas home. There, as big and shiny as the day Hargis saw him on television, resides Oom-A-Gog, a metallic TV icon for a whole generation of Tulsa-area kids. Hargis, 38, is the son of the famed evangelist Billy James Hargis, who ran his anti-Communist Christian Crusade ministry from Tulsa in the '50s, '60s and '70s. 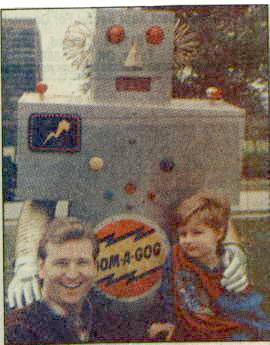 As a child, the younger Hargis was -- like tens of thousands of other Tulsa-area kids -- a big fan of the local afterschool TV show, "Big Bill and Oom-A-Gog," which featured host Bill Blair, a studio audience full of kids, cartoons, puppets and a giant metal robot named Oom-A-Gog. The program began in 1959 on KVOO (now KJRH), Channel 2, and lasted through 1964. Oddly enough, Hargis' earliest memory of "Big Bill and Oom-A-Gog" is a relatively sad one. "I remember the show from when I was in kindergarten," he recalled recently. "My entire class from Barnard Elementary went to see Oom-A-Gog, and I came down with chicken pox and couldn't go." Later, however, he caught a good glimpse of his hero. And was he impressed! "I remember seeing him at the Fairgrounds and just being blown away," said Hargis. "Here was this huge, shining robot. You'd watch other shows -- 'Captain Kangaroo', 'Superman' -- but Oom-A-Gog was special. I think it was because he was in town and people knew about him and you could see him at the Fairgrounds. He was ours." A decade later, Hargis had left his childhood behind. He graduated from Edison High School and enrolled at American Christian College, the school his father founded and ran in the early '70s. He was also appearing on his dad's television broadcasts. "At that time, my dad was broadcasting over KTEW (Channel 2)," Hargis said. "Between tapings, I'd wander around the studio, and one day I went back to this big warehouse. It was dark, and they had these big tall shelves full of stuff, and right there sitting at the very top was Oom-A-Gog." Hargis couldn't believe it. He started visiting the storeroom at intervals, where he would gaze up at the hero from his past. "It was sad to me," he said. "Here he was, in this dimly lit warehouse, forgotten, peering out from the darkness. And he was forgotten. Scripps-Howard had just bought the station, and all the people managing it had been brought in from out of town. Oom-A-Gog meant less than nothing to them." So, when Hargis' high-school sweetheart came home from college for Thanksgiving break, and Hargis decided to surprise her by meeting her at the airport as Oom-A-Gog, he had no problem borrowing the suit from Channel 2's operations manager. "A friend of mine named Gary Blevins and I got a Christian Crusade van and hauled Oom-A-Gog to the airport," he said with a smile. "It was dusk when we got there, and I've got this thing on, and he's leading me across the parking lots. "What was so wonderful about it was how many people remembered Oom-A-Gog. They were coming up to me in the airport, asking me to hold their babies, to shake hands with their kids. It was like he was a long-lost movie star -- and really, that's exactly what he was. "It was exhilarating," he added. "I decided then and there that I was going to try and buy him. His sitting back in that warehouse was just too sad a fate." He went back to KJRH and offered the operations manager $250 ("an enormous amount of money for me at the time"). The operations manager said he'd ask the station manager about it, and they ended up giving Oom-A-Gog to the young Hargis. "I know now that it had a lot to do with my father spending so much money with them," said Hargis with a chuckle. "But I didn't think about it then, or if I did, I didn't care. All I knew was that it was a dream come true. And it still is." Later, when he left Tulsa to manage a radio station in Beaumont, Texas, he took Oom-A-Gog along with him. And several years later, when he moved to Houston, the robot went right along. These days, Hargis works as an actor and singer, doing motion picture, television, commercial and voiceover work in Houston, as well as singing with the Houston Grand opera on the Go program, which puts on programs in Houston-area schools. He has appeared in several feature films, including "Texas Snow Line" and "Pray for Death," and recently performed with Cathy Rigby in a stage production of "Annie Get Your Gun." But even though he's many years past his childhood, Oom-A-Gog continues to hold an almost magical fascination for him. "Even though," he laughs, "my wife, who's from Jackson, Miss., thinks he's just an eyesore." The other day, Hargis decided to get his old friend out for a little refurbishing. Specifically, he wanted to recreate the Oom-A-Gog logo on the robot's chest just as it had looked on the show. It wasn't that easy. The original logo had been painted over years ago, and when his sister searched the Channel 2 files for an original picture to use as a pattern, she couldn't find one. He tried to take fresh yellow paint and follow the raised lines of the original lightning-bolt logo under the old paint, but he not only "made a mess of things", but also was unable to remove his botched coat of paint. In desperation, Hargis and his wife found "a can of something called Liquid Sandpaper, which had been left by the people who had the house before us. "I didn't know what it was, but I tried it -- and it not only took off my yellow paint, but it took off the copper paint that had been put on years earlier. And there, underneath the second layer of paint was the original logo, in perfect condition, the original paint still on it. "I don't know when I've had anything more amazing happen," he added with a wide smile. "I felt like an archaeologist. It was like a miracle from God to me."